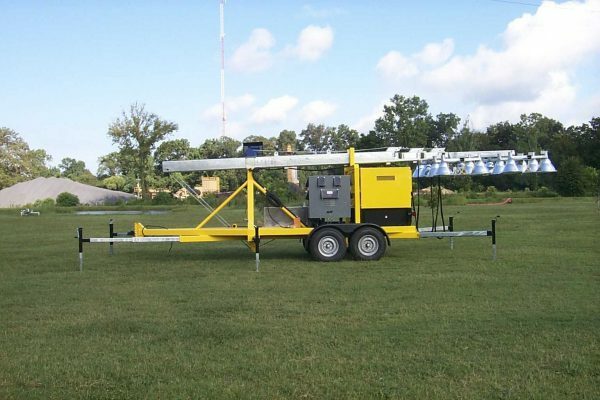 100 FOOT ULTIMATE PORTABLE STADIUM LIGHT-TOWER 16 X 1500W MH package: Telescoping 100′ Tower operates by an ELECTRIC pushbutton controller that will pivot then telescope tower system to an operating height of 100′. Special tower safety features include automatic tower stop when reaching 100′ max height. Tower will automatically lock in place preventing tower from lowering if cables or tower winch is compromised. A Bossltg exclusive safety feature is a RED BEACON LIGHT that flashes to alert site personnel that there is a Bossltg HIGH MAST TOWER in motion. 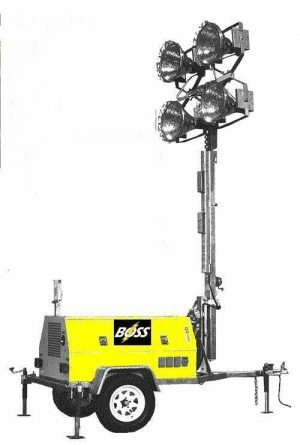 This model Bossltg 100 FOOT ULTIMATE PORTABLE STADIUM LIGHT TOWER 16 X 1500W MH has 16 x 1500w Metal Halide Floodlights at 100′ above grade will take the place of 20 – Standard FOUR – light 30′ Rental light Tower Products; Will Illuminate 100+ acres and project a beam of light 2500 ft at a 180* or 360* beam spread pattern. Operates for 3 Eight Hour working shifts. Powered by a BOSSLTG 45kva gen-set that comes wired to a Day Timer allowing operator to set gen-set to turn on lights at dusk and off at dawn. Huge cost savings on long term rental projects. 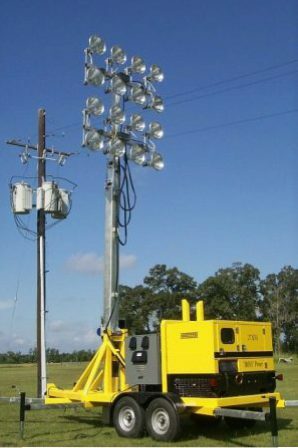 Bossltg Rental Stadium Light Tower units can be supplied with 500 gallon portable fuel cells to extend operating time up to 300 + hours. Axillary 120v GFCI power panels are available for site operations that need power outlets during the day. Bossltg 100 FOOT ULTIMATE PORTABLE STADIUM LIGHT-TOWER 16 X 1500W MH Rental units can be supplied with 500 gallon portable fuel cells to extend operating time an additional 300 hours. 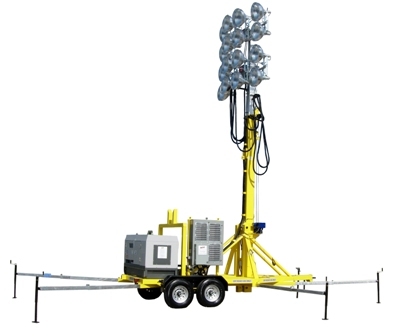 Project cost Savings: Using Bossltg Stadium Towers will save on over-all site fuel consumption. Huge labor hours saved to start/stop towers, daily. Plus the labor costs to fuel and service multiple towers each week/month. Auto Start Stop Day Timers: This operating feature allows site management to set the time they would like the tower lights to come on at night and when to turn them off in the morning hours. Especially if Bossltg Stadium Light towers monthly billing is based on gen-set total hours of use, monthly. 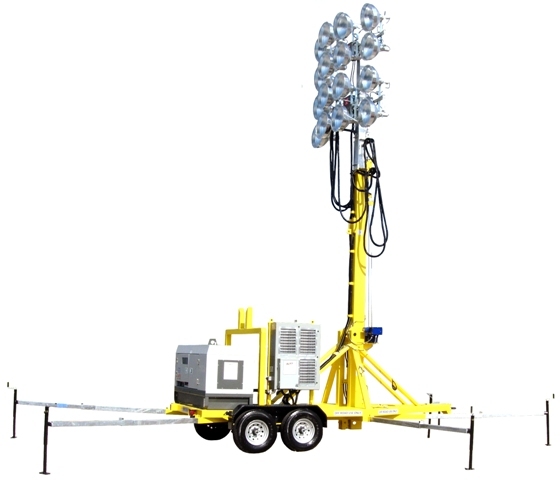 High Wind Speed Tower Monitoring: A Bossltg 100 FOOT ULTIMATE PORTABLE STADIUM LIGHT-TOWER 16 X 1500W MH comes with High Wind Speed Detection that automatically lowers the tower when winds exceed pre-set limits. 100′ towers are set at 45mph. This is an added safety consideration to ensure tower stability for any high wind project concern. Safety Tower Features: 100′ tower will automatically stop when reaching 100′ extend height. At this point a steel pin ram will lock the telescoping members preventing them from lowering if the cables or winches are compromised. Automatic tower stop at lowered nesting position. This prevents any backlashing of cables on winch drums. Red Beacon Light: Flashes when the telescoping tower is in motion. The safety feature alerts crane operators, area safety superintendents, and general work site personnel that a Bossltg 100′ high mast tower is in motion. 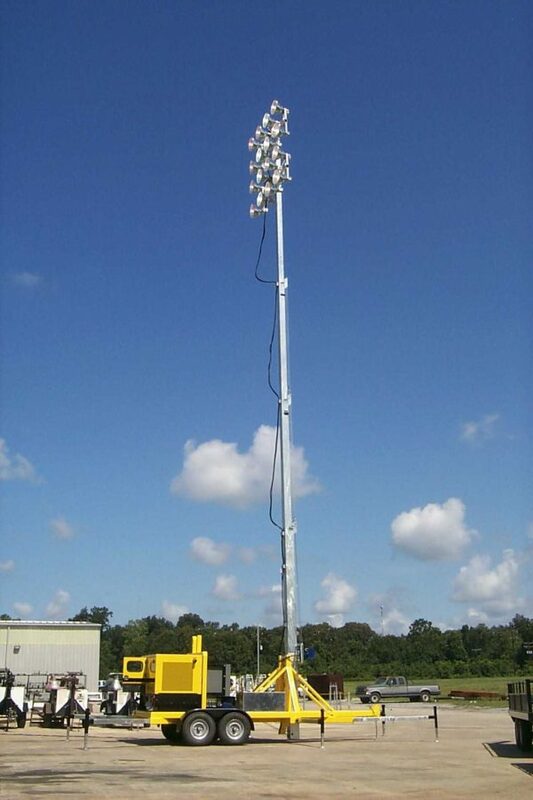 Floodlighting System: This Bossltg 100′ stadium high mast light tower is equipped with 16 x 1500w Metal Halide floodlights. Depending on the positioning of floodlights on tower these sixteen lights has the potential to illuminate over 100+ acres of work site area. Floodlight Control Panel: All 16 floodlights are controlled by a single ON/OFF fused disconnect switch. Each floodlight is individually fused protected with a GREEN indicating light to identify floodlights in use. This ballast system fixture identification system helps field service techs to quickly determine lighting faults. Also allows field service techs to communicate on phone with Bossltg Trouble shooting professionals to quickly determine fault cause. Axillary 120 Volt GFCI power panels: For projects that need to use the gen-set 120 volt GFCI electrical outlets during the day shifts, Boss will supply Bossltg Temp Power stations that plug into the 125/250v California Receptacles on gen-set power panel. Each 120v power panel will have 6 x 20amp, 120v, GFCI duplex outlets or 12 x 120v plug-ins for power tools. NOTE: Bossltg would recommend Unlimited Use gen-set rental contracts when using axillary power panels. Metal Tire Boots: Special fenders that bolt under tires to allow trailer to be pulled over rocky or muddy areas. 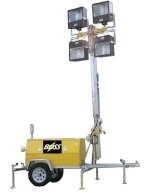 SPECIAL CONSIDERATIONS: All Bossltg Stadium Style light towers are available for rental with 90 day advance notice. Hazardous Environment Design Light Tower 6kw – 4 – 1000w Metal Halide Floodlights, Divsion 2 Floodlights, Division 1 plugs and receptacles, Emergency Shutoff Valve, Spark Arrestor Muffler.